Flow diagram of the selected study population. 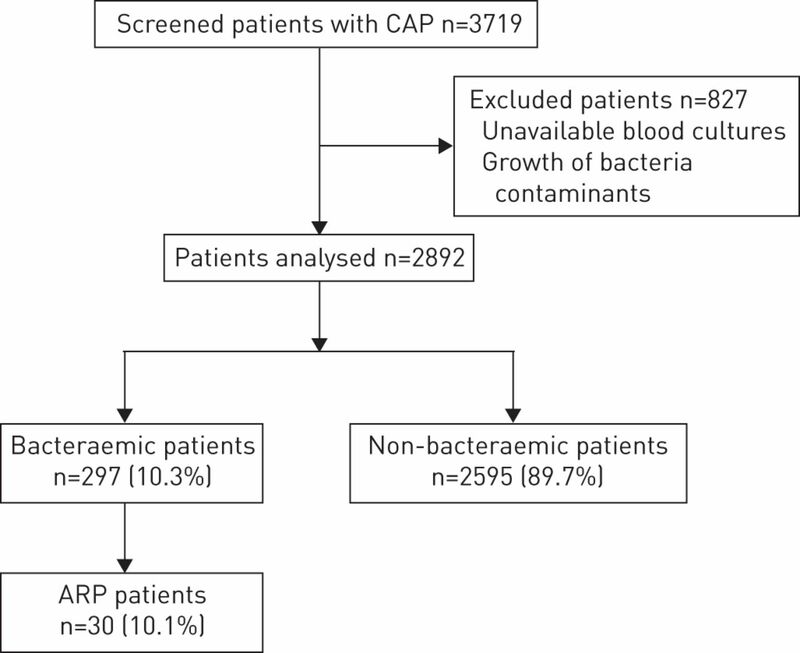 Receiver operating characteristic analysis of significant variables derived from the logistic regression model in their capacity to predict patients with bacteraemia caused by antibiotic-resistant pathogens. AUC: area under the curve. Data are presented as n (%). MRSA: methicillin-resistant S. aureus; MSSA: methicillin-sensitive S. aureus. #: antibiotic resistant pathogens (n=30). 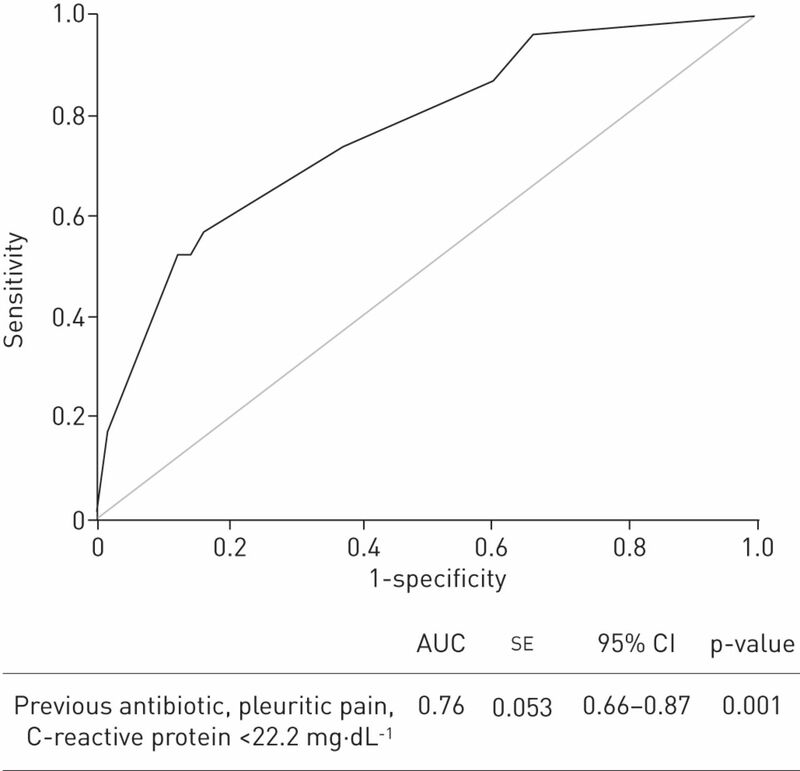 PSI: pneumonia severity index; CURB-65: confusion, urea >7 mmol·L−1, respiratory rate ≥30 breaths·min−1, blood pressure <90 mmHg (systolic) ≤60 mmHg (diastolic), age ≥65 years; ICU: intensive care unit; #: Hosmer–Lemeshow goodness-of-fit test, p=0.32; ¶: the p-value corresponds to differences between the three groups (not ventilated, non-invasive or invasive). Data are presented as %. ICU: intensive care unit. The risk of having bacteraemia with one, two, three, four or five factors is 19%, 11%, 3%, 2% and 2%, respectively. The risk of having bacteraemia (after excluding previous pneumococcal vaccination) with one, two, three or four factors is 19%, 10%, 4% and 3%, respectively. Previous antibiotic treatment refers to if patients received antibiotics any time during the 2 weeks prior to hospital admission for CAP. Pneumococcal vaccination refers to the 23-valent polysaccharide pneumococcal vaccine (PPV23), if the patient received a vaccine in the last 5 years. Serotypes covered by PPV23 have shifted and now the indicated vaccine is the conjugated 13 valent. CURB-65: confusion, urea >7 mmol·L−1, respiratory rate ≥30 breaths·min−1, blood pressure <90 mmHg (systolic) ≤60 mmHg (diastolic), age ≥65 years. #: Hosmer–Lemeshow goodness-of-fit test, p=0.70; ¶: variables included in the definition of healthcare associated pneumonia. PaO2: arterial oxygen tension; FIO2: inspiratory oxygen fraction; PSI: pneumonia severity index; CURB-65: confusion, urea >7 mmol·L−1, respiratory rate ≥30 breaths·min−1, blood pressure <90 mmHg (systolic) ≤60 mmHg (diastolic), age ≥65 years; ICU: intensive care unit; CAP: community acquired pneumonia; ARP: antibiotic-resistant pathogens. #: Hosmer–Lemeshow goodness-of-fit test, p=0.050; ¶: the p-value corresponds to differences between the three groups (not ventilated, noninvasive and invasive); +: length of hospital stay was treated as a continuous variable and >7 days indicates the increase by 7 days; §: the p-value corresponds to the differences between the three groups (non-bacteraemic CAP, non-ARP bacteraemia or ARP bacteraemia).